You can write a slice for the Two Writing Teachers community today. Join us here at the end of 2015. It's always good to read what everyone shares. Thank you Stacey, Tara, Anna, Betsy, Dana, Kathleen, Beth, and Deb. I hope everyone has had a nice holiday, whatever you celebrate, or are still celebrating, and that it hasn't been too upset by the weather. I had a wonderful Christmas, my son and family are still here, we'll continue to be with my daughter and family when we can, and they are enjoying spending time with good friends, and skiing too. A huge part of my life is literature, both old and new, and another part is old stuff, little things, furniture, art, and vintage greetings. I have old Christmas cards and books, and greetings given a long time ago on Valentine's Day. I enjoy looking at the beautiful art and reading the more formal language. Here is the cover and one page of a little book I found last summer at a used bookstore (not where I'm volunteering) in Denver. 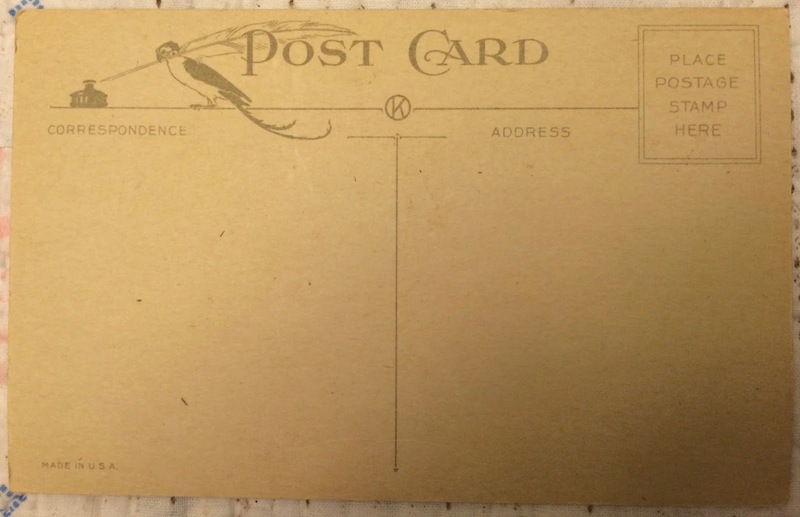 And the front and the back of an old postcard. This "after Christmas" week is the time I begin preparing to welcome the new year, as Rainer Maria Rilke says so beautifully, "full of things that have never been." Wishing you all a slice of wisdom coupled with kindness in this new year to be. If needed, click on the photos to enlarge. Love how you treasure these old things! There's such beauty there!!! Glad you're enjoying time with family! Happy New Year! Thank you, Michelle, and Happiest of new years to you also. I love the Rilke line. 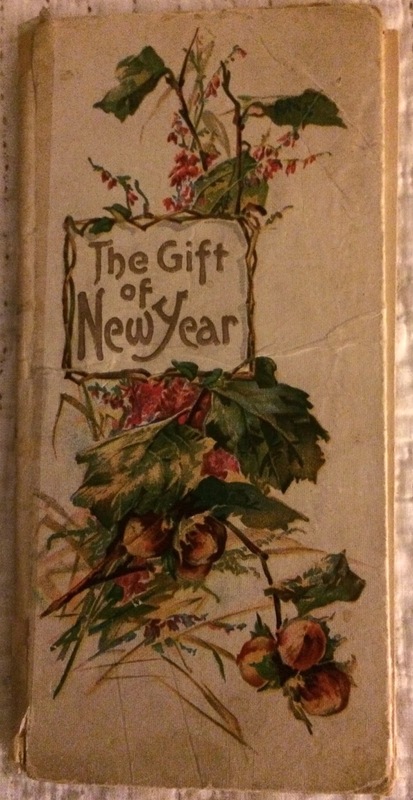 Welcoming a new year with things that have never been. Happy 2016 to you, too, Linda. Wishing both of us many experience of welcoming of things that have yet to be. I love that line too, Deb, and perhaps use it too often. However, I'm wishing you a year filled with new things, too. "A slice of wisdom coupled with kindness" is a wonderful wish for the new year. Thanks for being that person, kind and wise! You're welcome, Margaret, always a goal! Happy New Year in this next year, a big one for your family, right? Me, too, Kendra, and Happy New Year to you and your family. I don't think I remembered this about you! These are beautiful! Enjoy your family on these cold, cold days! Thanks, Carol. So different from a few weeks ago! Happy New Year to you and the boys! Thank you for that unusual but profoundly beautiful New Year wish a slice of wisdom with kindness. An unusual thought but true because sometimes wisdom comes hard won. Indeed! Thanks, Bernadette, looking forward to a good year connecting with everyone. The new year is a gift and a chance for us all to move forward and hopefully be better than we were in the past. Happy 2016 to you and your family. Thank you, I get so excited about a new year, and welcome it with new ideas and plans. Happy New Year! Thank you for sharing these lovely images and sentiments. 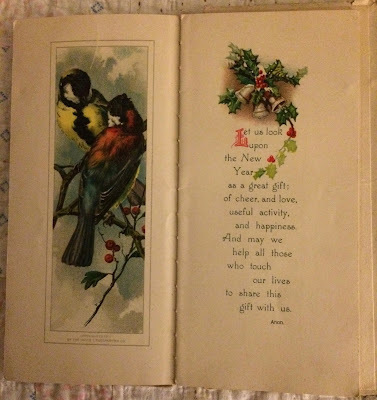 My grandmother had albums full of old postcards and boxes of greeting cards, too. Sadly, I think they all were sold to a dealer when we cleaned out her house. There was a limit to what we could keep! Happy New Year to you, dear Linda! I've given away many postcards as I cleaned out, Catherine. I think my mother and Arvie's mother kept them all through the years, their own and then those from other family, too. I've cut back, but keep those that I really love. Thanks for the wishes! Happy New Year, dear sister! Love your writing, rememberings, and treasures of what was and what will be! Thank you, makes me happy to see you here! Happy New Year! Hope all is well today! Old "stuff" is good stuff. Especially valuable when we look for "new" . We need to remember the lovely language of the past and hold on to it. Thank you! You're welcome, Julieanne. Keeping the old with the new is certainly what I do. The old and the new - I love the thoughts of "full of things that have never been"! Thanks, Joanne. I love that quote too, keep it close always. Linda, thank you for always spreading kindness through your digital compositions and posts. I did not know that you share my same love of ephemera. I have an assortment of antique postcards for every holiday that I proudly display as you do. Happy New Year! How wonderful, Carol. They are so beautiful, like even the back of the postcard with that lovely bird and pen. Thank you! What a lovely find! Thanks for sharing it with us. Best wishes to you in the new year! Thank much, Jane. I'm anticipating what happens this year to us. The old page and postcard were unexpected, at the same time the messages they carry sound so much like you. Your slice shines warmth and kindness. Wishing that the last two days of this year will bring beauty and joy to you. Thanks Terje, you know I wish the same for you. Love the vintage cards. They are lovely. Just saw your ice cold Coke post on FB. Glad you disposed of the rest w/out incident. Here's to a wonderful new year filled w/ fun! Thank you. The "coke" thing was quite a mystery at first, but then I figured it out. Happy New Year, Ramona. What fun! It is so interesting to see how people wrote (and talked, I think?!) so much more formally in the past! Part of me likes it, and part of me is glad we don't anymore! Happy New Year! I like reading it, but I'm glad we don't have to use it either, Jennifer. Thanks, and Happy New Year! 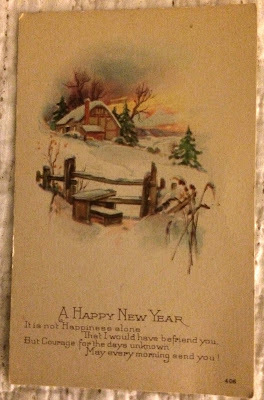 May 2016 be kind to you and your family, Linda. Thank you, Stacey. It's rather nice to think that you have two times in the year to reflect and start anew. Happy New Year to you and all the family. I am a collector of old things too. I sheepishly admit that when I look at some of your pictures, I always look in the background to see some of your treasures! Happy "full of things that have never been" to you, Linda! Aw, thanks Leigh Anne. I'm happy that you "peek". We would have a good time out antiquing together, wouldn't we? Happy New Year! "Full of things that have never been." Beautiful words! Wishing you all the best in 2016. I look forward to read about all of the new things that will come into being for you, Linda. Thanks, Jennifer, and I feel the same. A new year coming is always exciting to me. "May we help all those who touch our lives." Ummm, Linda, do you need some help? Love the lines in the old card--very different than what we see today. Rilke's words, "Full of things that have never been" are great as well. Thanks for touching my life in your words, and thanks for being such a source of inspiration. I think I should snap photos of my mom's Christmas card paintings and write about those...thanks for the reminder. Maya, you are lovely to ask, but no, I'm fine. You're welcome for the wishes. The new year is soon here, always time to reflect. I love that you have your mother's Christmas card paintings. How wonderful to write with them as inspiration.